I have just been reading a florid 4th of July oration from 1827. (Pardon me if I find myself looking for a certain enameled fixture.) I have always found the 4th of July to be a dispiriting occasion. In the modern world, what does one do, exactly, on the Glorious Fourth? In the 1827 oration they had a "a grand military display with martial music" and a big outdoor dinner with the whole town in attendance. Well, not the whole town. Only the men. The "ladies" only appeared briefly to present a "splendid standard"which they had presumably knittedto the artillery company. Then they retired to eat in magnificent isolation and to plan the flag they would make to give to the infantry the next year. There was also a civic procession culminating in a festival of public speaking: a reading of the Declaration of Independence, an oration praising the Declaration and the American Revolution (q.v. ), prayers and toasts. Nowadays, we can have a barbeque picnic, much like the one we had on Memorial Day, and very similar to those scheduled for Victory Day (to celebrate the triumph of Rhode Island over the Japanese) and Labor Day. In the evening we can watch John Wayne movies (q.v.) on TV and hear distant rumble of fireworks (q.v. ), reminding us disturbingly of what it must be like to be in the vicinity of bombardment. Although the early nineteenth-century practices sound more engaging, I'm not sure how much I'd like to experience them. It would be like Christmas (q.v.) in reverse, only all the "treats" would be stultifying and bad. Take, for instance, the cherished Declaration itself. What kind of reading does it make? It starts out pretty well with a nicely-turned phrase"When, in the course of human events"and before we have a chance to lose interest moves on to the arresting, "We hold these truths to be self-evident, that all men are created equal; that they are endowed by their Creator with certain unalienable rights; that among these are life, liberty, and the pursuit of happiness." This sentence is all most people remember of the Declaration of Independence. This is the enduringly influential part, and it might as well beperhaps it were better if it werethe whole thing. 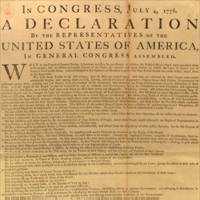 The rest of the Declaration appears to be some rather dangerous and specious theorizing about when governments should be overthrown, of which I am sure the United States government does not approve either at home or abroad, and, quite egregiously, a laundry list of complaints leveled at the British. Among the many problems with this list are: 1) it is boring beyond belief; 2) many of the charges were exaggerated or untrue; and 3) in light of our current and longstanding alliance and friendship with Great Britain the preservation of these accusations as anything other than an object of arcane antiquarian interest is deeply embarrassing. That the Declaration was read aloud in 1827 was merely bad taste. To intone its rolling phrases to the modern world reveals Americans as hypocritical and insensitive. Its reading ought to be an occasion for searching self-examination, humility, and regret. A sort of civic Day of Atonement. Collectively, we ought to be saying, "I'm sorry, God, I won't do it again." Thomas Jefferson (q.v.) is the reputed chief author of the Declaration of Independence. I have heard others push the claim of Tom Paine. The whole thing has a Paine-ful ring to it; for it sounds like the style of the fellow who penned, "These are the times that try men's souls." (Incidentally, why is it Thomas Jefferson and Tom Paine? If we get to the bottom of this little naming puzzle we will, I believe, have a key to the understanding of American history (q.v.).) In the days leading up to that first fourth, Tom did a lot of dining with Thomas. I can well imagine crafty old TJ making notes on his napkin under the table while the voluble Paine alternately stuffed his face and let deathless phrases trip off his tongue. But let's leave Tom Paine out of it. He is one of the neglected figures of American foundational history, a little too disreputable and too critical of religious orthodoxy to be admitted into the canon of Revolutionary fatherhood. Let us, for the purpose of argument, believe the legend that Jefferson wrote the Declaration practically by himself. (Ignoring also the Disney (q.v.) version that it was Benjamin Franklin's (q.v.) mouse that dictated it to hapless Thomas). Why should we feel so good about a document that has Jefferson preaching to us about equality, unalienable rights, liberty, and the pursuit of happiness and damning the absolute tyranny of the King? Jefferson was a slaveholder after all! He thought black men not up to human standard. (Though he found their ladies scrumptious.) And he was a Virginia aristocrat. He believed in equality for all . . . Virginia white male aristocrats with plenty of money and time on their hands because slaves, women, and indentured servants were doing all the real work that had to be done. This reminds me of another embarrassing foundational document, the Magna Carta (q.v.). In that, the "Magnificent Charter," 1215, bad old King John (q.v.) had to concede the rights of the people. Who were these people? Not the thirteenth-century versions of you and me, buddy, no sir and no ma'am, the "people" were the noblemen. Accent on noble, accent on men. And when you ponder just how hoity-toity you have to be to be noble, just remember that Winston Churchill, "the Great Commoner," was the son of the Duke of Marlborough! And when you read English history, with its struggles between the nobility and the commons, it is important to keep in mind that the "commoners," the guys who filled the House of Commons, were really a bunch of second-rate aristocrats. All the fabled struggles for the rights of ordinary people have, until very recent years, been to extend the franchise only a little bit more, from the older to the younger sons of families already listed in Debrett's Peerage. It is only later wilful misinterpretation of these early documents that has given them any liberating power. It is only in retrospect that we are able to understand the Magna Carta as a charter for everybody. For who, nowadays will admit that he or she is not one of nature's nobles? And it was much later that the Declaration of Independence, as read and re-interpreted by Abraham Lincoln, began to have its currently accepted effect. Now Abe Lincoln knew how to write. And he knew when to stop writing. The Gettysburg Address, a truer American foundational document than the Declaration of Independence in my opinion, is a model of eloquence and restraint. No laundry list of complaints against the South to embarrass us in later generations. Just a moving exhortation, reaffirming and reconstructing American values, with the implication that all combatants who died on that celebrated field, Northern and Southern soldiers alike, gave their lives for a "new birth of freedom." I cannot read that brief speech without a tear rising to my eye. The rich guys who signed the Declaration of Independence hoping for a break in their taxes and a cut in tariffsJohn Hancock (q.v.) et althe eighteenth century equivalents of the Enron CEOjust give me the pip. They got independence from Britain, and, as a consequence, got richer than ever before. What they really merited was a spanking. Thinking about the history that followed, the American Constitution and so forth, I'm rather glad they avoided their paddling, but those rebels deserved it nonetheless.